Home » FAQs » Which advantages brings the use of mixed microbial cultures? Which advantages brings the use of mixed microbial cultures? The main reason of the present high cost of PHA production is due to the fact that industrial processes are based on axenic cultures of a single selected strain (i.e. Cupriavidus Necator) that, in turn, requires ad-hoc designed substrates (e.g. glucose coming from food crops) and high energy demand (e.g. substrate and equipment sterilization, high cell density). On the other hand, novel open bioprocesses, based on use of microbial mixed cultures (MMC), allow both to require less energy and to use low- or no-cost feedstock, such as organic wastes with no competition with food chain. Indeed, any fermentable organic waste can be, in principle, converted into PHA through a multi-stage process. This latter includes an initial acidogenic fermentation stage whereby the organic feedstock is converted into volatile fatty acids (VFA) which are the most direct substrates for PHA production. 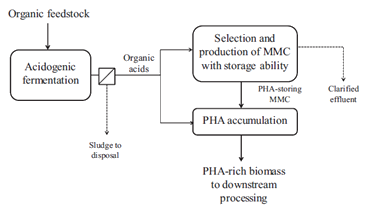 The obtained VFA-rich stream is fed to both a reactor for the selection and enrichment of the MMC in PHA-storing microorganisms (second stage) and to a PHA-accumulating reactor (third stage) in which the storage ability of the selected mixed culture is maximized. In principle, the better the microbial selection in the second stage the higher the PHA production in the accumulation reactor. Overall, the operating conditions (such as pH) of both the second and the third stage strongly impact the final polymer composition which is, primarily, affected by the composition of the VFA mixture deriving from the first stage of the organic waste acidogenic fermentation. This makes particularly interesting the use of MMC since by chancing the operating conditions of the process it is possible to easily tune the composition of the P(HB/HV) copolymer and, therefore, the final properties of the obtained polymer. Importantly, the produced MMC-PHA is a 3-time by-product since it is generated from renewable bio-waste, through a conversion process which is mostly biological, and it is completely biodegradable. It is, however, noteworthy that the final product is not a recycled polymer, because it is a virgin material that has been newly synthesized by selected microorganisms and presents suited characteristics for specific uses.